Posted on 01/13/2016 by Mickey McCarter	in Live Review and tagged Black Cat, Comet Ping Pong, DC, DC9, post-punk, psychedelic, punk, Time Is Fire. Back in July, I went to the Black Cat to check out the noir cinema pop of Brooklyn band KATIEE. However, like everyone else there, I was rather stunned by the opening act, DC psych quartet Time Is Fire. The four men in Time Is Fire cite DC punk as an influence on their band, and occasionally they marry some post-punk guitar structures to their upbeat musical style. However, when they really get rolling, they become a full-blown psychedelic jam ready to enthusiastically throw down as a wandering dance party all by themselves. 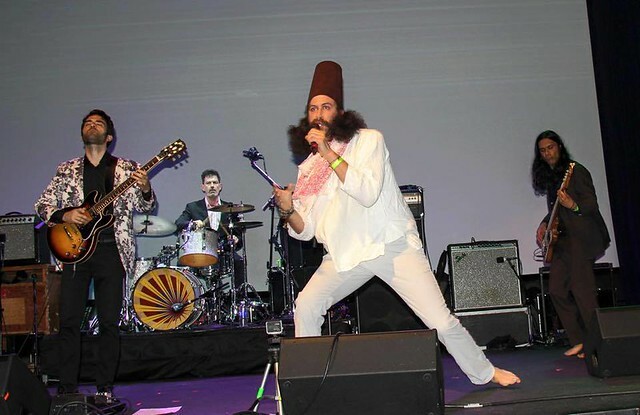 Sometimes frontman Kamyar Arsani sings in English and sometimes Farsi, and the instruments in the band tend to move with him from more traditional rock to hazy Middle Eastern rhythms. It’s totally appropriate given that Kamyar is a daf player and Sufi poet who grew up in Tehran, where he absorbed both Western and Persian music. He is joined by drummer Jim Thomson (CSC Funk Band, Bio Ritmo, GWAR, Alter Natives), guitarist Matt Perrone (Alma Tropicalia), and bassist Ashish Vyas (Thievery Corporation, GoGoGo Airheart). Time Is Fire really come alive in concert. When they play, they are fully in their own world, weaving a sort of hypnotic field, but they also enjoying themselves so fully that it’s downright infectious. The band have announced two shows in the coming months. They open for Social Station at DC9 on Thursday Jan. 28, and then they appear with Prince Rama and SISTR MD9IGHT in a lineup at Comet Ping Pong on Saturday, March 5. Tix for the DC9 show are available at the door; tix for the Comet Ping Pong show are available online. It’s well worth your time to check them out! Posted on 01/05/2016 by Mickey McCarter	in Live Review and tagged A Sunny Day in Glasgow, Australia, Comet Ping Pong, Philadelphia, shoegaze. Philadelphia-born sextet A Sunny Day in Glasgow returned to DC in lush, hazy glory Sunday evening. The shoegaze collective hit Comet Ping Pong at the end of a short tour that provided them the opportunity to play new songs from a nine-track double EP, Planning Weed Like It’s Acid/Life is Loss, released last November. The new songs showcased the band’s well-known strengths — sweet harmonies from vocalists Annie Fredrickson and Jen Goma as well as big, fuzzy guitars from founder Ben Daniels and Josh Meakim. Posted on 12/28/2015 by Mickey McCarter	in Live Review and tagged A Sunny Day in Glasgow, Comet Ping Pong, dreampop, EZTV, Outer Spaces, Philadelphia, shoegaze. As the year 2015 winds down, we at Parklife DC are looking forward to our first recommended show of 2016! And it’s going to be a pretty good one: Shoegazing collective A Sunny Day in Glasgow have returned with a new double EP, Planning Weed Like It’s Acid/Life Is Loss, and they are returning to DC to perform at Comet Ping-Pong on Sunday, Jan. 3, 2016. 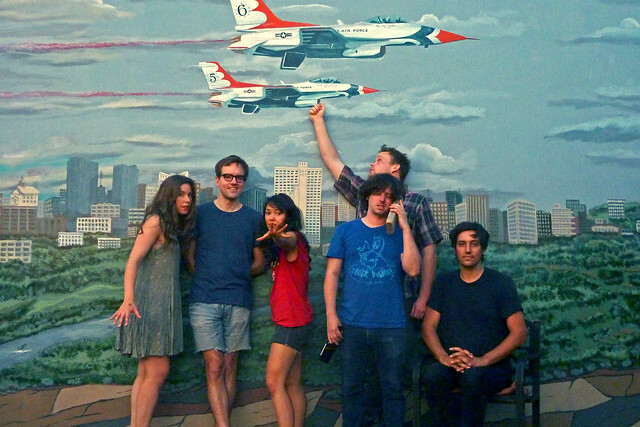 The happy, hopeful attitude continues on their most recent synthy single, “Hey, You’re Mine,” which singer Jen described to Spin as an internal conversation with yourself about moving forward. 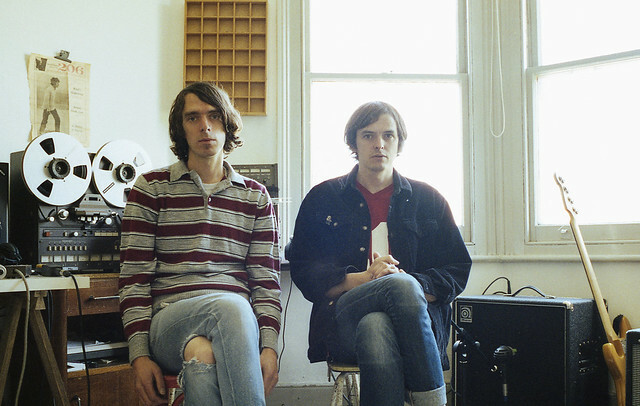 NYC power poppers EZTV and Baltimore folk rockers Outer Spaces open for A Sunny Day in Glasgow. Tickets are available online and at the door. Don’t miss this rare opportunity to see these shoegazer innovators! Posted on 12/22/2015 by Jeremy Bailey	in Live Review and tagged Aimée Collet Argote, Alternative rock, Comet Ping Pong, Des Ark. After a lengthy sound check that turned into a request to switch off the PA system in the second song, Des Ark finally got into their groove at Coment Ping Pong on December 16th. 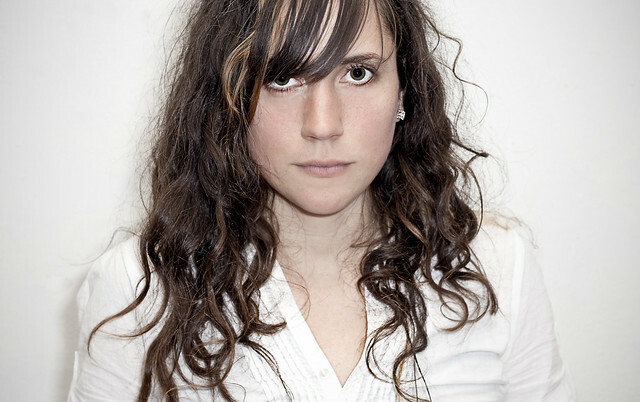 Des Ark consists of singer/guitarist Aimée Collet Argote and drummer Tim Herzog, along with a few others. Their latest album, Everything Dies, highlights Aimée ‘s folky, breathy voice and starts off with songs of angst and pain, from the perspective of women who are wronged or abused. The title is apt and the lyrics are heartbreaking. But then there comes a perceptible shift towards quiet optimism. Towards something worth fighting for. Des Ark started off their set with such a more optimistic song from the album, “French Fries Are Magical”, which has the affecting question, “What can I believe, until you believe in me?” at its heart. A few songs later, they played their strongest song (or at least my favorite) from Everything Dies, “Snake Stuff”, about heartbreak in love. “If I don’t learn to love, I’m going to die of fear.” The melody soared above the small, but tightly packed crowd. Put together, the song writing and lyrics can incite a sense of melodically, while the gentle melodies and almost atmospheric music bring the mood into quiet harmony. “Don Taco & His Hot Sauce Toss” starts off with a twangy banjo and moves into a happy acknowledgment of youth in love. I didn’t catch the names of all eight or so songs Des Ark played, so I focused on the ones I knew from listening to Everything Dies. The Comet Ping Pong space is small, and one side is simply blankets hanging down separating the music room from the restaurant. But it’s a perfect, intimate venue for a band like Des Ark, who has songs to deliver that are quiet and important to hear. Check out Everything Dies, and give Des Ark a listen. The Comet Ping Pong show was their last in 2015, but they pick up again in mid-January in North Carolina, then tour through mid-February throughout the country, before ending in Savannah, Georgia (3/12/16) after a month gap. Posted on 12/10/2015 by Jeremy Bailey	in Live Review and tagged Aimée Collet Argote, Alternative rock, Comet Ping Pong, Des Ark, folk. Listening to Des Ark’s latest album, I had to chuckle at some of the song titles. Des Ark, coming to Comet Ping Pong on Wednesday, December 16th, is primarily singer/guitarist Aimée Collet Argote with a mix of rotating members. It is clear Aimée likes the word ‘motherf***r’ a great deal, as two of the songs feature the word in the title. It is also clear that she has a bit of a sense of humor, with songs titles like, “French Fries are Magical” and “Don Taco & His Hot Sauce Toss”. Everything Dies is the title of their third full length album, and is a quietly strong set of songs that are both sentimental and slightly folky in nature. Apparently (though I have yet to experience it myself), their shows are a wide mix of music styles, from loud rock to the softer, compelling ballads. Their video, “Snake Stuff”, is more akin to the softer side. Come out to Comet Ping Pong and see what the fuss is all about. Posted on 09/23/2015 by Mickey McCarter	in Live Review and tagged blues, Comet Ping Pong, England, jangle pop, psychedelic, Ultimate Painting. Ultimate Painting take their name from a piece of artwork created by Drop Artists of the Drop City commune of Colorado in 1966. Around the same time in New York City, Lou Reed and John Cale formed the Velvet Underground. 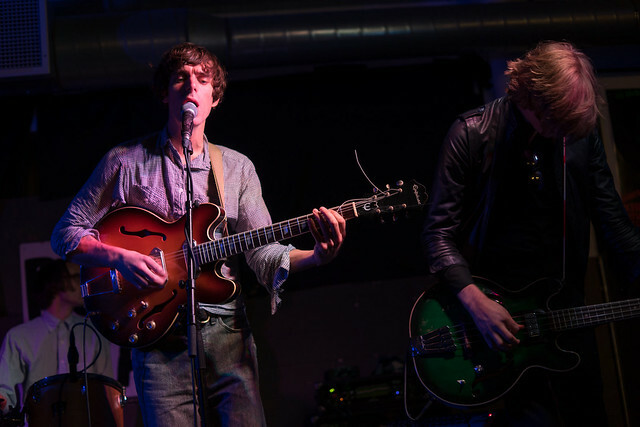 Just a few years back, James Hoare of Veronica Falls and Jack Cooper of Mazes formed a third band, drawing its name from the colorful piece of art and its sound from guitarwork by Reed, Cale and Sterling Morrison. The result is a jangly, occasionally bluesy, sort of psychedelic rock that pays tribute to the ’60s quite masterfully while sounding fresh. 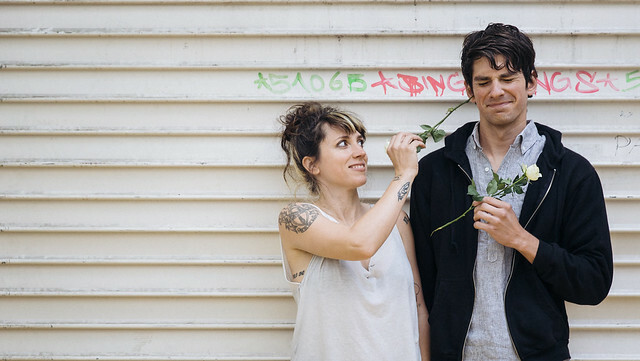 The duo played a show at Comet Ping Pong on Tuesday as a stop on their tour in support of their new album, Green Lanes, released in August by Trouble in Mind. They kicked off their set with some songs from their debut, a self-titled album released in 2014. Posted on 09/21/2015 by Mickey McCarter	in Live Review and tagged Comet Ping Pong, England, jangle pop, Mazes, Ruby Fray, The Beginner's Mynd, Ultimate Painting, Veronica Falls. I’ve never seen Mazes, but I caught Veronica Falls a few years ago at the Black Cat, and I found their sunny, jangly guitar pop to be quite lush. Well, when I wasn’t looking, UK indie poppers Jack Cooper of Mazes and James Hoare of Veronica Falls formed another band called Ultimate Painting. 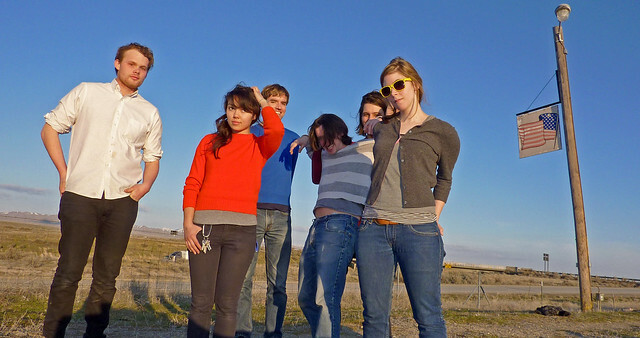 Indeed, Ultimate Painting released its second album, Green Lanes, this summer (via Trouble in Mind). The songs pleasantly have the same sort of summery, jangly sound found in Veronica Falls. The duo have been touring in support of the album, expanding the band to a quintent with AJ Cozzi, Neil Robinson and Will Young — and they are visiting Comet Ping Pong on Monday, Sept 21. With songs like “(I’ve Got the) Sanctioned Blues,” Ultimate Painting bring together some twee guitar with pleasant vocals as they go in search of better times somewhere. You can preview and order the Ultimate Painting album online from Trouble in Mind Records.